Craft talk — 4:15 p.m., Alumni House Conference Room, UAlbany. Free parking in the Dutch Quad lot. 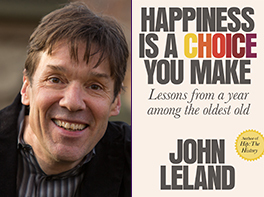 John Leland, Metro Reporter for the New York Times, is the author of the national bestseller, Happiness Is a Choice You Make: Lessons from a Year Among the Oldest Old (2018), a book that challenges accepted notions about aging, contentment and quality of life. Eminent health columnist Jane Brody called it, “inspired and inspiring,” and AARP The Magazine called it, “uplifting and wise” and a starred review in Kirkus also praised the book, "Engrossing . . . Few books about aging show such clarity and purpose or so deftly blend clear-eyed examinations of social issues with a realistic but hopeful cast of mind. In this edifying and often quite moving book, Leland presents the "lessons" taught by his subjects even as they themselves are learning them, and he does so with an empathy and thoroughness that deserve our gratitude." A former senior editor at Newsweek, Leland is also the author of Hip: The History (2004), “an insightful chronicle of cool” (Esquire), and Why Kerouac Matters: The Lessons of On the Road (2007). Cosponsored by The Albany Guardian Society: Service to Seniors in the Capital District. While the morning event is currently at capacity, you may sign up for a waiting list by going to www.albanyguardiansociety.